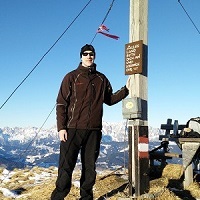 Home » Hiking Tips » How to use barometer on a Suunto watch to predict the weather? Many Suunto watches are equipped with a barometer which is indeed a very useful feature because it allows you to predict the weather and alerts you if thunderstorms are developing. A barometer measures atmospheric pressure which is the weight of the air from the top of atmosphere all the way down to you. Since the weather affects the air pressure, a barometer is a great tool to predict the weather. High pressure is almost always a sign of good weather while low pressure tells us that the air is rising which results in clouds and precipitation. Note that when the air is rising, it cools down, condensates and forms clouds. 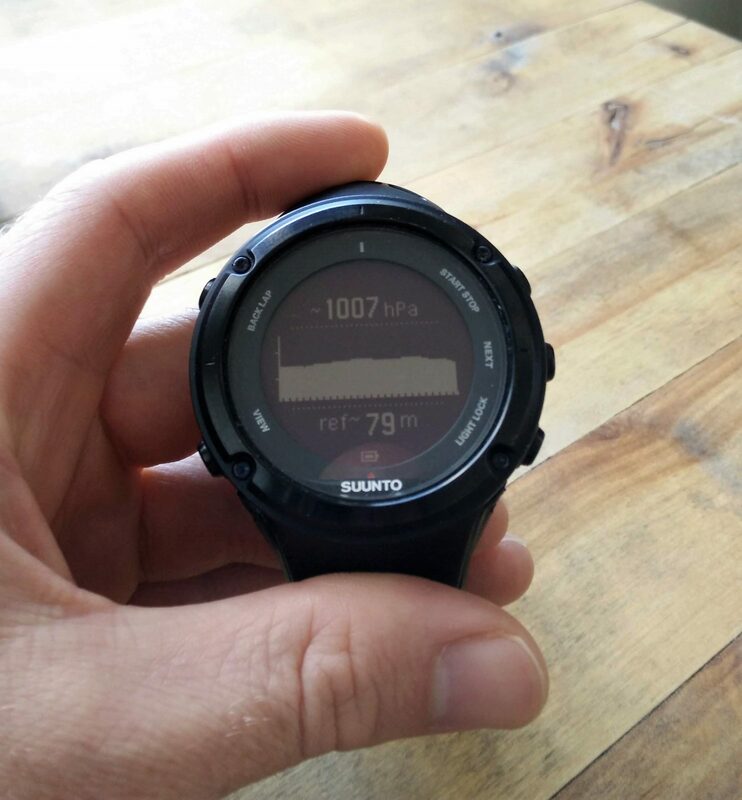 In the following we’ll explain how to use the barometer feature on a Suunto watch to predict the weather. So far, the following Suunto watches support barometer; Core, Vector, Ambit, Traverse, Spartan Alti Baro and the new Suunto 9. All these watches also show the barometric pressure graph which makes predicting the weather even easier. How to use barometer on a Suunto watch? How to set up the barometer? How to access the barometer? How useful is the barometer to predict the weather? To access the barometer settings, press the “next” button on the right side for three seconds and then navigate to “Alti-Baro”. Select profile and choose between Automatic, Altimeter or Barometer. If you select Automatic the watch will automatically switch between altimeter and barometer. When you make a stop it will show the barometer, but as soon as the watch detects that you are moving it will switch to altimeter. This works well for most people, so we recommend that you choose the Automatic option. Another thing you might want to set here is the storm alarm feature. We recommend that you enable the storm alarm so that the watch will warn you in case that thunderstorms are forming. 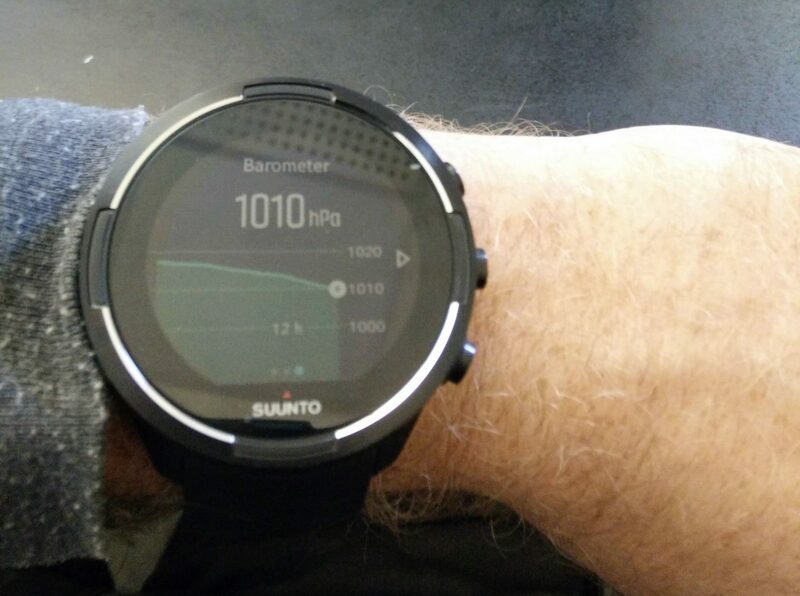 Suunto 9 and Suunto Spartan Alti Baro watches continuously measure both altitude and barometric pressure. Therefore, they don’t have the “select profile” option. To set the storm alarm on Suunto 9 or Suunto Spartan watch, press the middle button on the right side for three seconds and then navigate to “Alarms”. There you can enable the storm alarm feature which will warn you in case that thunderstorms are forming. To access the barometer simply press the next button and the watch will show you the barometer profile. Note that if you set the barometer profile to automatic you should be stationary while doing this, otherwise the watch will show you the altitude profile. The barometer profile shows (from the top down) current weather icon, current barometric pressure in hPa, graph with barometric pressure data from the past 27 hours (1 hour recording interval) and the bottom row shows the temperature, time, sunset/sunrise time or your current altitude (toggle by pressing the view button). During exercise, you can’t just access the barometer by pressing the next button, assuming that you are tracking your workout. To access the barometer during exercise you will have to additionally configure your watch in the Movescount web app. To do this, login to the Movescount web app and hover over your profile picture in the top menu. Select watches and click on the sport mode in which you want to use the barometer (for example running). Click add display and select barograph under environment. Now you will be able to access the barometer during the exercise by pressing the “next” button on your watch. You can access the barometer on Suunto 9 or Suunto Spartan watch by pressing the “down” button 4 times and then the middle button 2 times. 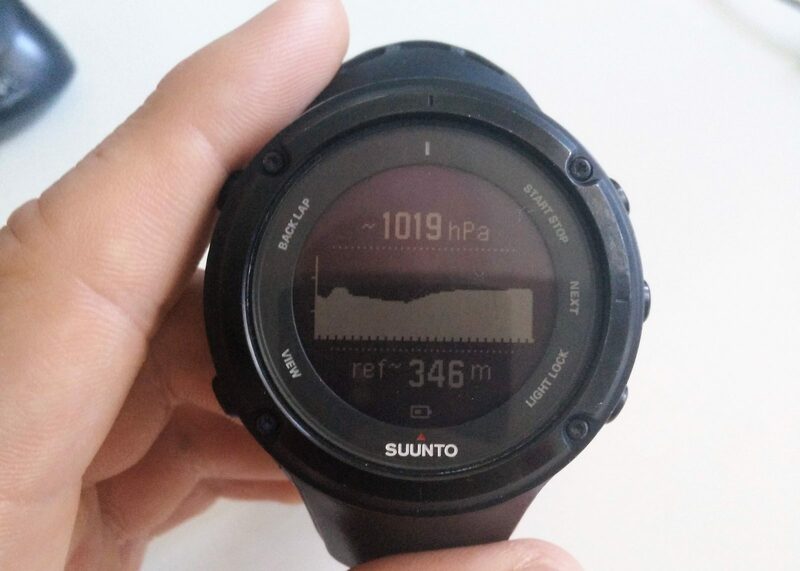 While Suunto Core, Vector, Ambit and Traverse watches show graph with barometric pressure data from the past 27 hours, the Suunto 9 and Spartan watches show graph with barometric pressure from the past 12 hours. This is not a downside because the 12-hour graph is indeed enough for predicting the weather. However, Suunto Spartan and Suunto 9 watches don’t allow you to access the barometer feature when you are tracking your workout. 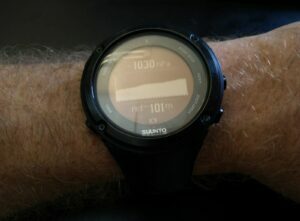 At the time of posting, it is not possible to add the barometer feature to sport modes in the Suunto Movescount web app. 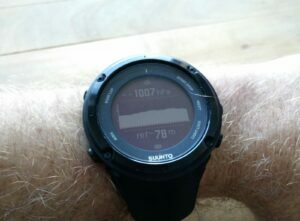 We assume that Suunto will fix this soon with an update. If the weather is likely to improve, the barometric pressure data displayed on the graph resembles a line rising from left to right (see the image). Note that the graph shows the barometric pressure for the past 27 hours and therefore you should be especially interested in the right side of the graph; i.e. how the barometric pressure changed in the last few hours. If the barometric pressure has been rising in the last couple of hours, it is very likely that the weather is improving. To accurately predict the weather in this manner, the weather conditions must be relatively stable. If the weather is deteriorating, the barometric pressure data displayed on the graph resembles a line that is falling from left to right (see the image). Again, you should be especially interested in the right side of the barometric pressure graphs as the right side shows changes in the last few hours. If you are in the mountains and you see that the barometric pressure is persistently falling, it’s probably best to head back down – it will become rainy or cloudy. If the barometric pressure data displayed on the graph resembles a line with sudden spikes and drops which exceed three pixels on the watch (see the image), the weather is very unstable. Unstable weather indicates a high possibility of thunderstorms. In case that you see such a barometric graph on your Suunto watch, it might be smart to postpone your outdoor adventure. 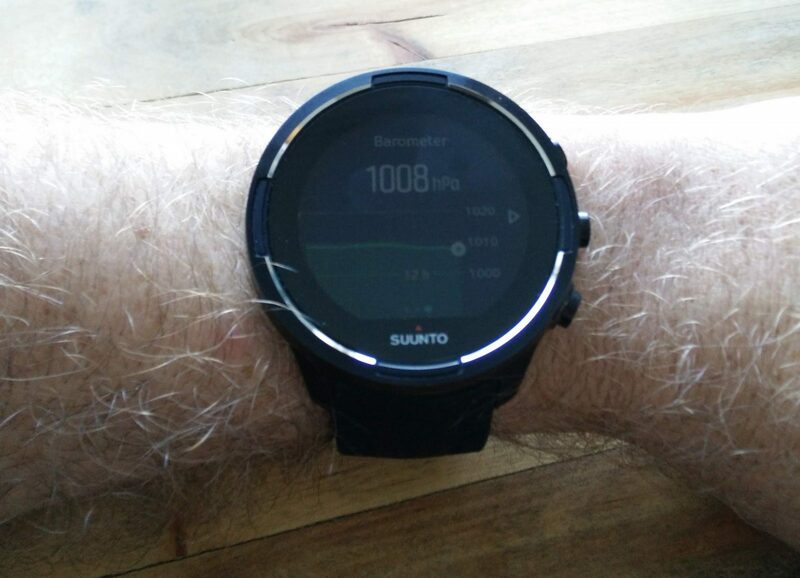 Thunderstorms occur rapidly when the barometric pressure drops, and my Suunto Ambit watch typically detects the danger of thunderstorms only an hour or so before they occur. Use that hour well by descending and finding a proper shelter. 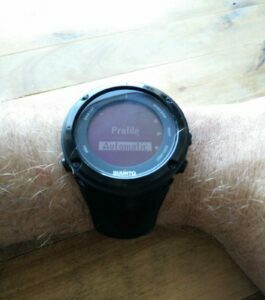 The barometer feature on Suunto watches is very useful, especially for multiday hikes where you don’t have internet access and thus the possibility to see the weather forecast (which might not be accurate for your location anyway). However, when it comes to a thunderstorm the watch typically detects it and triggers the storm alarm very late (one hour before the storm or so). Nevertheless, from the barometric pressure graph you can access the weather stability – and if it is not stable, it’s probably best to stay at home or close to shelters (mountain huts etc. ).